I was really exited to try potatoes in the Instant Pot! I wonder why I haven't tried this sooner, but like most of my other friends, there is some hesitations when using the Instant Pot. I have found that if you just try it, it works out! 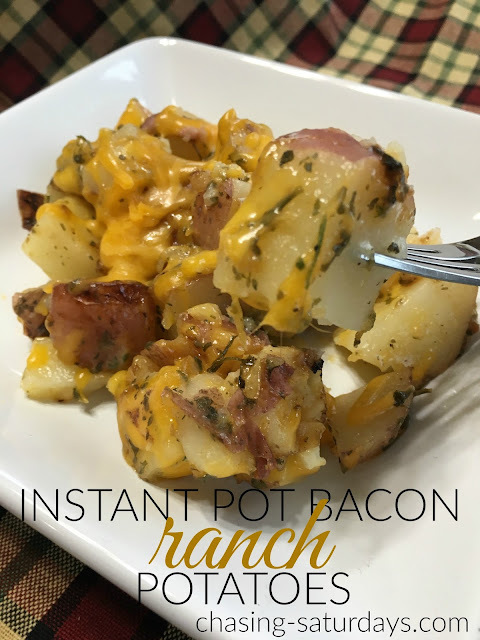 I love all the flavors that come with this Instant Pot Bacon Ranch Potatoes Recipe. We really took on a big project this summer. Because of the wet spring, planting the garden was later than normal We also planted more produce than the previous years. These pictures were taken in June. We had a problem with potato bugs this year. Usually after the potato plants die, the bugs disappear. They have stayed in the garden, and are now on the tomato plants. If you could see the garden right now, the potato plants are not as green. Most of the plants have died off, and we are able to enjoy the potatoes. We have an overabundance of potatoes, red and white potatoes to enjoy! Making them in the Instant Pot was faster. My family loves to eat potatoes, so I made a big batch of Bacon Ranch Potatoes. I cut up 3 pounds of red potatoes and put in the Instant Pot. I cut up 7 slices of bacon and added to the potatoes. Moisture is important when cooking in the Instant Pot, add 3 tablespoons of water. Add parsley, garlic powder and salt and pepper. Set the Instant Pot to 10 minutes. When it is done, set quick release. I put a kitchen towel over the valve when I set the quick release. Stay away from the steam. I mixed in a packet of Hidden Valley Ranch Seasoning Mix, you can add what you want for taste. Mix in shredded cheddar cheese, and serve. Wash and cut the potatoes into 1 inch pieces. Add potatoes, bacon and 4 tablespoons of water into the Instant Pot. Stir in dried parsley, garlic powder, salt and pepper. Set the instant pot to manual and set the time for 10 minutes. Release the pressure and carefully open the lid. 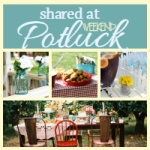 This recipe was made with 6Qt Instant Pot. Add ranch dressing and cheese and stir to combine. Serve immediately. You can serve out of Instant Pot Bowl.